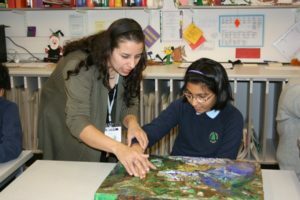 Linden Lodge, situated in Wandsworth, South London, educates students who are visually impaired and those who are disabled with visual and or hearing impairments. 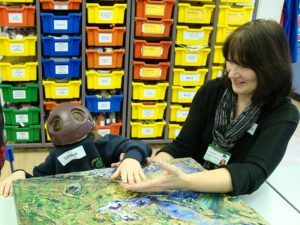 They specialise in addressing sensory and physical difficulties in relation to education. I met Roger Legate OBE, the Principal of Linden Lodge at their summer fair in July 2009. During the fair, together with some of the students, we created a large painting using tactile materials which was to be placed in one of the reception areas within the school. Following on from the fair, I was invited to do two separate workshop days with various classes at Linden Lodge. The students were a delight to work with. We had a lot of fun together and the staff at Linden Lodge were extremely helpful. 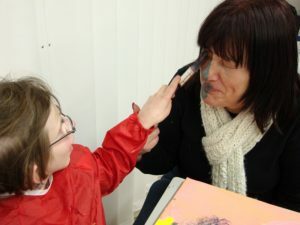 It was also an honour to work with the amazing volunteers who came to the school and assisted with the students’ needs. The whole energy of the place and the people was so positive and generous. Having had a great response from the students from the first two sensory sections of the workshop, we went on to create art using different tactile materials. 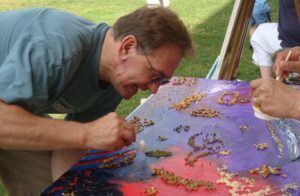 I would like to share with you an example of the way art can transcend so many barriers including physical and emotional, especially when working with those people who are multi-disabled with visual impairment. Serena was a lovely young lady (14 yrs) who came into the classroom at the beginning of the workshop wearing a helmet. The helmet protected her head as she banged it on the table whenever she became distressed. Serena had multi-disabled challenges including visual. Serena also had her head in her jumper for a good hour during the first section of the workshop. Her carer, Ann, explained this is how Serena reacted to strangers. During the session, I was able to make Serena laugh a little, showed her she could be at ease with me and we were here having fun together. By the end of the day, Serena was not only out of her jumper, but also had her helmet removed and was happily painting not only the canvas but also Ann and I. We had nicely painted blue faces at the end of that session. Ann told me that she had never seen Serena become so comfortable so quickly with a total stranger before and that she really enjoyed the workshop, especially as she had such a lovely piece of art that she had created herself and could show her mum and dad. I was smiling for days after that session. Workshops like this one are the reason that I want to share them with as many people as I can.